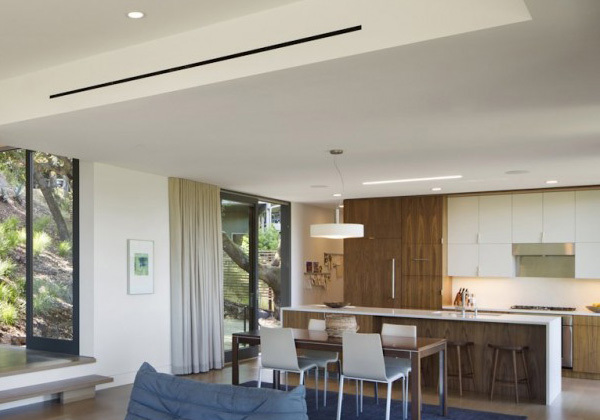 A lot of people believed that nature influenced the astounding features of a contemporary house design. A location can be near the bodies of water or a part of land resources. Clients desired to have a house design that is exactly connected with nature for they experience the real meaning of comfort. Also to be able to achieve the most amazing style and design that they usually see from the other house designs in other countries. Today, we will be witnessing how the designer successfully responded to the client’s demands as well as associate the location to its house design. 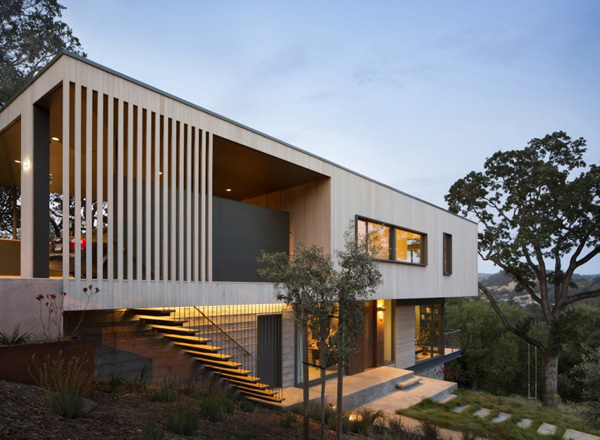 This house is specifically spotted in Marin County, California and named as the San Anselmo House. What is special in this house is that the designer creatively incorporates the features of nature and its location to the style and concept of this house. 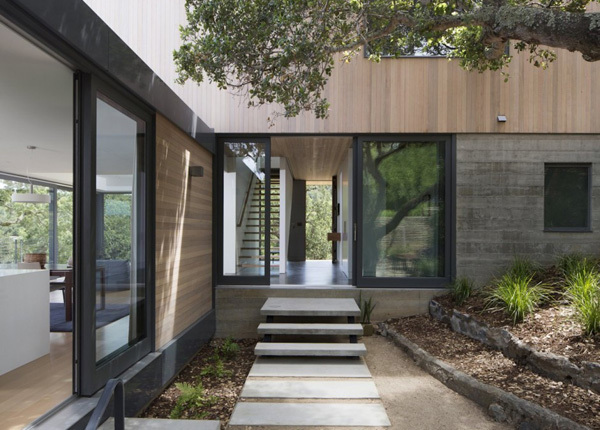 Its exterior has an intensive accessibility to the surrounding landscape. Let us see more of the different areas of this house through the selected images below. 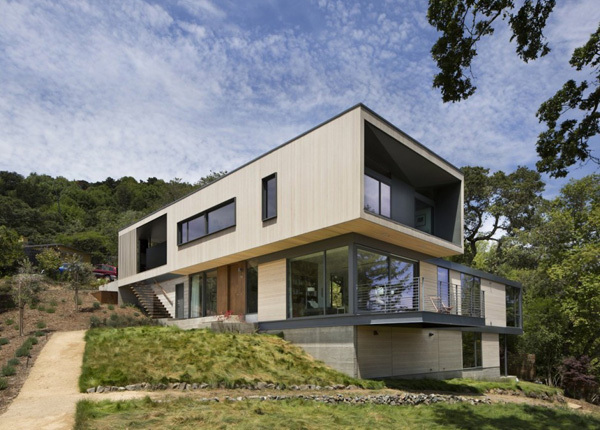 See how the geometrical figure of the house building complements with its location in the hillside. Plants all over the exterior highlighted the pathway to the entrance of the house. LED lights installed in the different areas of the interior underline the wooden furniture and excellent accessories that made this fashionable and charming. 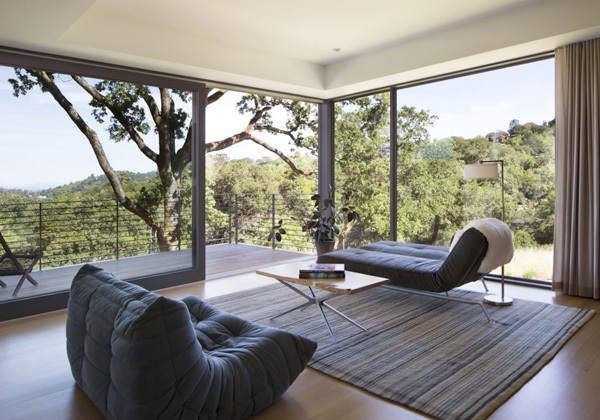 Open glazed doors are very crucial to maintain the connection of the interior to its exterior. Comfy and stylish sofa ensures relaxing and worry-free zone for the client to enjoy every morning with the panoramic views. 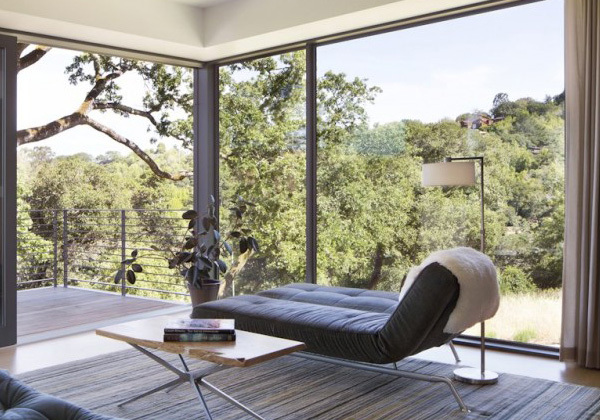 Floor-to-ceiling glassed doors and windows efficiently provides the opportunity for the homeowner to take the full advantage of the green trees and views outside. 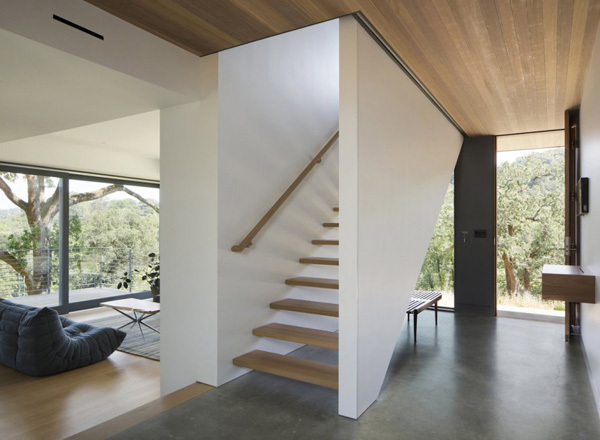 Even in the interior, the designer used staircases to emphasize its hillside location. Lets witness how the white, wooden and grey stone palette makes this house stand out among the other house designs in the neighborhood. 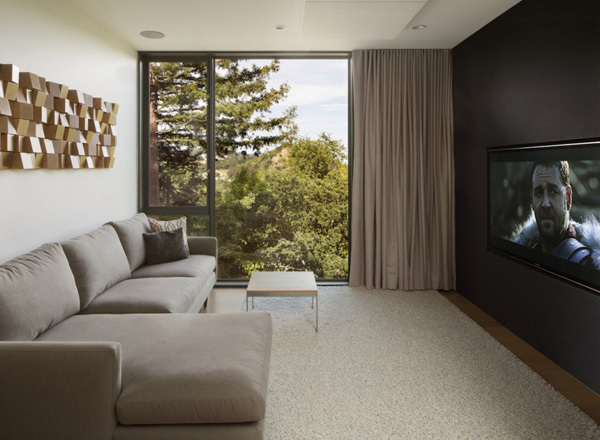 Huge and high definition television is securely set in the family room where the client may spend quality time with his kids and at the same time captivates the scenic views outside. 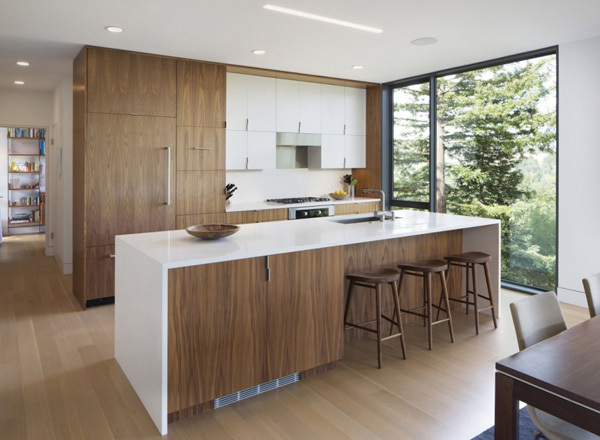 The house may never be complete without this cozy and modern kitchen design with the trendy and wooden furniture. 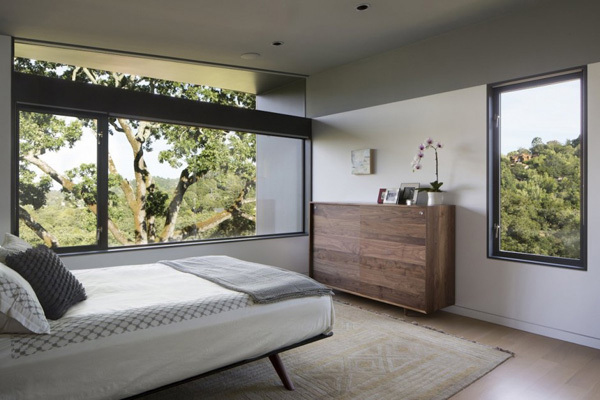 Patterns and shapes are revealed in this well-improved and neat bedroom. 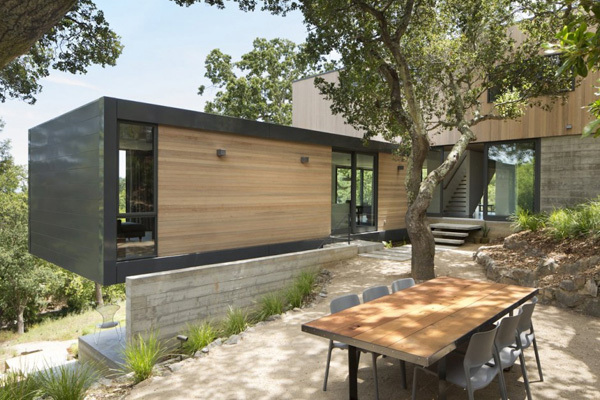 The exterior patio and the cantilevered deck as an extension of the living spaces are stressed here. Here’s the wooden cantilevered deck that seems floating in the air when you sit down in the table set assigned in this area. When the dark comes the installed vivid lights in the exterior are very helpful in highlighting the building’s unique shape and design. Textures, lines and figures are well-displayed in the exterior even when the peaceful night comes. Definitely the images above presented the different amazing and natural beauty of the location. 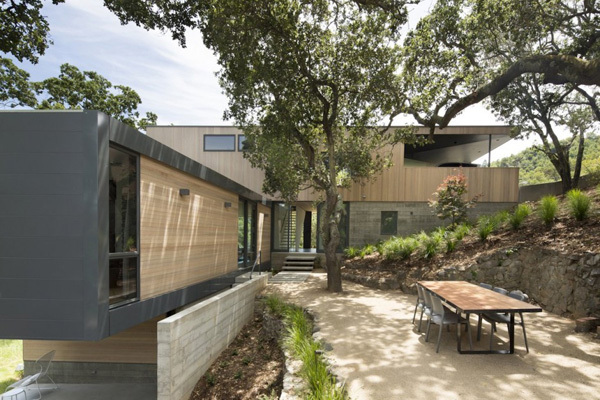 The Shands Studio indeed effectively merged the strong value of nature to come up with a high fashionable design of the house. 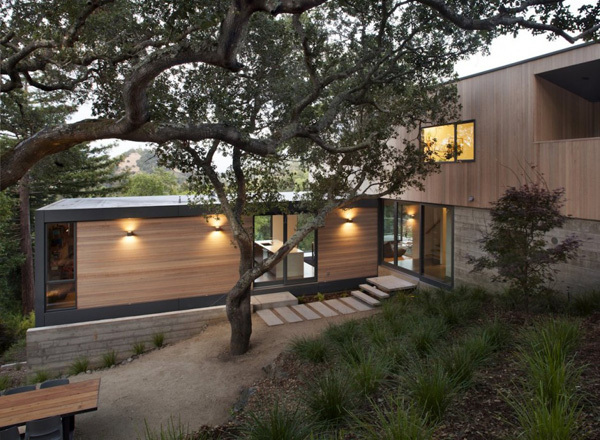 Sustainability also is a great factor in completing the house concept and layout. The upper level was designed with an inverted hip roof to maximize the exposure for solar panels. We hope that once again we have shared to you a house design that will inspire you and enhance the plan layout of your future house.